Potted bulbs such as tulips, daffodils and hyacinths add a refreshing touch of Spring indoors during the winter months. With a little know-how they can be recycled to rebloom outdoors. In order to utilize the bulbs for the next season, remove the dead flower heads. Keep the soil evenly moist and let the foliage continue to grow until it dies back naturally. Never remove the leaves until they have completely turned yellow/brown and pull away. This process will store up energy into the bulb for the next season’s bloom. Make sure that the bulbs are firm, free from soft spots and don’t have an unpleasant ordor. If they do they should be thrown out. Saved bulbs can either be planted outdoors in the spring as soon as the weather permits or kept in the pot and planted in the fall. Plant your bulbs in a well-drained area as too much water during the summer season can rot your bulbs. It can take forced tulips 2-3 years to rebloom outdoors. -If you store any bulbs in the refrigerator keep them away from fruit and vegetables. The ethylene gas they emit will disfigure or abort the developing flower. *Did you know tulip petals are edible. The flavor depends on the variety. The petals taste like sweet lettuce or baby peas, some have a cucumber texture and flavor. Before you eat make sure they are pesticide-free or organically grown . Hi may name is Sheila , I received tulip on Easter. I left them in the pot . It is now October I removed them from the pot and soil. I have placed them in a zip lock bag . Want to repot them . what do I do the bulbs look good . not soft. firm. what can I do so the will bloom next spring. I have stored tulip bulbs planted in containers in my garage over the winter. It is now February and I don’t know when to take the out of the garage and put them on the west facing porch. The tulips planted in the ground on the east side of the house are peeking through the ground, but cold winter weather is still in the forecast. When you see some green peeking from the soil in your container, will be an indicator that tulips are ready to start growing. You can then take them outdoors. But also keep in mind, if temperatures get below freezing, the tulips will need protection from the cold. I received some potted plants for my birthday. they are amethyst, lilac and daffadils. I have never done well with flowers. They are already dying! How should I be taking care of them? It’s best to keep potted plants away from direct sunlight but give the bright indirect light. Keep them in a cooler room and they will last longer. Potted bulbs such as tulips, daffodils and hyacinth usually last from 7-14 days. Hi, why are my tulip flower stalks twisting and flattening up ? The were growing healthily but suddenly, the stems started twisting up And were also flat when I came back from work ( the bottom and top part of the stem are still plump ) .The flat and twisted stems couldn’t support the flower, so I had to stake them … Please answer this as soon as possible, thanks 🙂 … P.s our country is warm year round ..
Tulip stems will continue to grow and elongate as they mature. Growers use a growth inhibitor to reduce elongation. Low light and warm temperatures will cause the stems to elongate, twist toward the light and become weak. To do well, tulips need bright indirect light and cool temperatures. hi, again, my hyacinth flower has withered and the leaves are starting to turn yellow, can i still use the bulb again ? Will it still bloom the next time i plant it ? thx. Forced bulbs drain much energy out of the bulb and should not be forced to bloom again. Some will discard the bulb. Hi,I live in Malaysia and it is a tropical climate and i just purchased a hyacinth plant for CNY . How do i make it last longer ? Can I put it in an air conditioned room next to a sunny window for at least 5 hours a day ? Yes, Place your hyacinth in a cool room (air conditioned) room and that will help prolong bloom time. Also, a sunny room is great just keep it away from a direct sun window that may heat up during the day. Indirect bright light is great. for more info see . I have a few questions. I have very bad soil in my front yard and I just bought some potted daffodils. I was wondering if I should keep them potted or if they can survive in “not so great” soil? Also if I do plant the bulbs in other pots, how big should the pot be and how far into the soil should the bulbs be planted? Live in the southern part of virginia. I bought a potted tulip from the grocery store, can I plant it outside now? I always tell people to enjoy the flowers and then when they are done blooming plant the whole pot outside when the ground is workable (not frozen). I’m sure yours is. Let the foliage continue to grow so that it can replenish the bulb for future growth. My husband gave me potted daffodils for my office on Valentine’s Day. It was a long weekend, and they didn’t get watered. When I came back to work all the leaves had yellow tips and were drooping. I watered the plant, but even now some of the tips are dark brown and a couple of the flowers still look like they’re dying. I know it’s only been 2 days of good watering now, but should I cut the brown tips off the leaves? I don’t want them to die! The brown tips are from drought damage. You can leave them as is or trim off the brown part. Daffodil flowers will last about 2 weeks and the leaves depending on growing conditions a few months. Treat then just like potted tulips. Eventually, all the leaves will turn yellow then brown. Once that happens you can plant the bulbs outdoors. for more info..see above article. I just received red and white tulips for Valentines Day from the grocery store. How long do potted tulips last? What can I do to keep them alive? Can I cut them to place in a vase indoors? How and when can I plant them in the ground? As you can tell I’ve never ever in my life planted flowers or have the slightest idea but I really want to learn and would absolutely love to grow flowers in my yard. Please help!!! I leave in Fresno Texas just in case. Potted tulips usually last about 10-14 days depending on the environment. If you keep them in a cooler place away from direct sun, they will last longer than in a warm, sunny spot. You can also cut the flowers and put them in a vase. The bulbs can be saved for future rebloom but there are some things you need to do to replenish the bulb. Make sure you let the foliage continue to grow. Also fertilize lightly (1/2 strength) while the leaves are growing. see the above article for more info on planting. Hello, my husband just got me a potted tulip plant from a local grocery store for Valentine’s Day. I’ve been researching online and pretty sure its Gavota Triumph (maroon w/yellow-edged petals). I would like to plant them outdoors – does this type multiply/spread? Forgot to mention that I live in Apache Junction, Arizona. Gavota triumph tulip is hardy in zone 3-8. Beautiful tulip mostly used as potted plants! It will multiply like any other tulip. Under good growing conditions it should produce bulblets. Due to receiving my bulbs too late to plant outside, I placed my tulip, iris and hyacinth bulbs in pots. Is this okay or will the not be plantable in spring? It is ok to plant them in pots. BUT tulips and hyacinths need a cool dormant period with temperatures above 40 degrees for 8-12 weeks so that they can develop a root system to grow. If you can keep the pots in a frost-free area for the winter you can replant the bulbs in spring. They may develop roots during that time especially if the soil is moist. Tulip bulbs I planted in October sprouted, as did bulbs from last year! Now the cold is coming… are they doomed? Should I cut back the leaves? It depends on how much growth your bulbs put on. I would leave the leaves. If its a 1 inch sprout, then it should be fine. Put some mulch over them after a hard frost to protect the new growth tips through the winter. I received a potted tulip plant. When I received it, the foliage looked slightly discolored. The plant died almost immediately. Can I clip everything off and replant the bulbs in the fall (provided they do not seem rotten)? I am in zone 5B. Thanks for any help. You can replant the whole pot in the ground now or wait until fall to plant them. I would leave the foliage until it turns brown and then clip it off. Just received a potted plant of dainty daffodils. They are for someone who will not be back in town for another 2 weeks. How to I keep these? Keep the potted daffodils in a cool place away from direct sun. The cooler the better. Potted daffoldils usually last about 2 weeks. Hi. I just received a potted tulip. 2 flowers have bloomed and 2 buds are present. I live in Seattle and it’s mid feb right now. Do i keep the plant indoors or keep it outside? What would be the watering shedule and sunlight requirements? I don’t have ground to plant them in so they have to remain in the pot, how long will they last like that ? Once they are done blooming, you can do one of two things either discard them or save the bulbs for the next season. In order to utilize the bulbs for the next year, you should remove the spent flower head, keep the soil evenly moist and let the foliage die back. Never remove the leaves until they have completely turned brown and pull away. This will store up energy for the next seasonâ€™s bloom. Forced potted bulbs may not bloom next year so I would recommend you give them to someone who can plant them in the ground. Further to my comment posted earlier, I left the pot outside and it continued to grow; no blooms tho’. Since it is only about -4C at night, and 1-5C during the day, can I leave it outside? Should I wrap just the pot with bubble wrap and newspaper to keep the roots warm, and leave the top open? Thanks! You can leave it outside but make sure it doesn’t freeze. Hyacinths prefer cooler temperatures. Since you hyacinth is continuing to grow, I would bring it indoors and let it grow on the windowsill. Hopefully, it will bloom. Since it is in the old soil, give it a light dose of fertilizer to help it along. The other option is if it far along repot it in fresh soil. I have many potted daffodils from my son’s place of business. I have let them die off in their pots. It is the first day of summer and the leaves are all brown. Should I plant them now or leave them in their pots? Should I put them in the shed or leave them on the deck? Water them or dig them up? Thanks for your help! Now that your daffodils have died back you can either leave them in the pot, store them dry and then plant them in the fall. 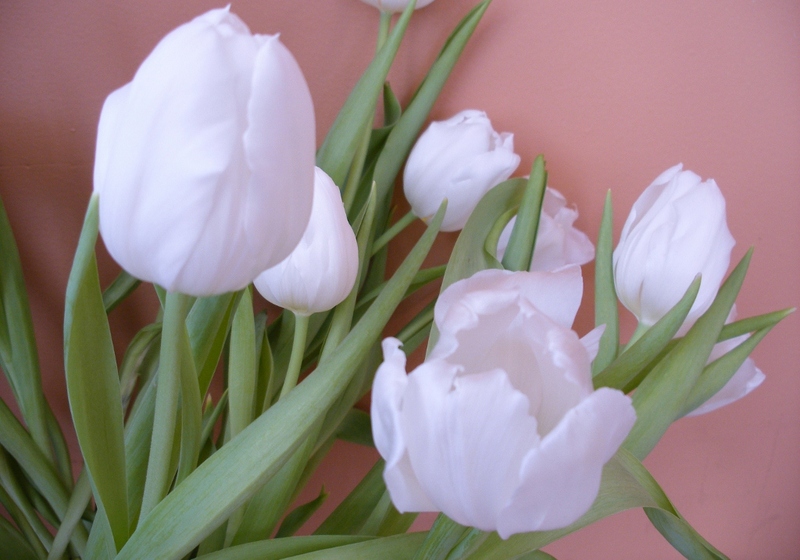 In February 2010 I received potted tulips in mid-February and they lasted about three weeks. The flowers fell off and the leaves are now drying out. They have been in my kitchen window (no sunlight, facing north) for two weeks. I let the soil dry out (which may mean they aren’t coming back!). Just need to know if they will re-flower at all. Should they stay in the pot, and if so, how long. Live in the Texas Hill Country, and would like to know if all tulips have same requirements or others–when to replant, let grow again, or what? No previous experience. Will appreciate your help!! If there were enough nutrients replaced into the bulb, then they may rebloom next year. The leaves need to continue to grow. It doesn’t sound like there was enough time for that. Plant the bulbs outdoors and see what you get next year. If there is any foliage present, let it continue to grow so that it will rebuild the bulb. Tulips need a cold dormant period of 12-16 weeks at 35-48F to bloom and your area gets cold enough to satisfy that requirement. You could try planting ferns, ivy, hosta (shade variety), impatiens. or begonias. Also shade houseplants can be used to fill in the container. Don’t be afraid to experiment and try some different plants. Just make sure that they are labeled as shade loving plants. Be sure that the plants get enough moisture during the summer so that they don’t dry out. Hi I live in Thailand, which is tropical climate, and I got hyacinth in December which coolest month here. How do I keep the bulb to plant next year. Hyacinth is one of those bulbs that needs a cold dormant period and a dry summer to rebloom the next season. It likes cooler temperatures to grow and bloom which must be December-Jan in Thailand. When finished blooming, it will have to continue to grow and then allowed to die back naturally so that the bulb’s nutirents are replenished. If that doesn’t happen then it will not bloom next season. You can plant it outside for the summer in well drained soil- or store the bulb in a cool dark place. Before replanting, you will have to store the bulb in 35-40F temperatures for 10-12 wks so that it gets its dormant period. If all goes well you may or may not get a flower. Anytime bulbs are forced to bloom, the chances of them blooming again are greatly reduced. It may not be worth the effort. How much water should I give a hyacinth bulb each day. I am using them in my science fair project on how much water effects the growth of plants. Are you growing your hyacinth in soil or water? If in soil, you need to water it when the top inch of soil is dry. Sorry, I can’t give you an exact amount. The amount of water will depend room temperature, amount of light exposure and type of soil. A plant will use up more water in warm temperatures and lots of light. That’s why we need to water more often in the summer. Plants in clay soil may need less water than those growing in sandy soil. When you water, give the plant enough water so that it drains from the bottom so that the entire root zone gets water. Good luck with your experiment! Hope you had a wonderful Christmas & New Year! I brought the potted bulbs indoor & kept them near a well lit window. Am pleased to see the hyacinths have begun to bloom altho’ the rest seem to be only growing leaves. I am going to leave them alone to let the leaves feed the bulbs for another season. The glorious purple of the hyacinths are beautiful & surprising seeing the pot was left unattended for the entire summer! Happy New year to you! I’m glad to hear something’s blooming. Let the bulbs continue to grow. You might want to give them a bit of fertilizer in spring. It should help replenish the bulb. Remember bulbs grown in pots or “forced” are reluctant to bloom the following year. Your best bet would be to plant them outdoors. Thanks for replying so quickly:) The pot has assorted bulbs- tulips, hyacinths, narcissuss, crocus. The shoots are about an inch, so if I wrapped the whole pot in newspapers, then bubblewrap and leave it outdoors, would they survive in our extreme Ontario winter, which can drop down to -30C? Or I could just bring them indoors and take the chance of blooms. Please advise. Thanks! It’s a gamble leaving them outdoors. If you do. in additon to the wrap, put the whole pot in a cooler or styrofoam container for added insulation. The trick during the winter is to keep the pot at a constant temperatures, so that it doesn’t fluctuate when there is a winter warmup. As I mentioned before, you probably will not get blooms. I best scenario for this situation is to plant the container outdoors but I know that’s not possible in your situation. Have a wonderful Holiday. My sister received a large pot of assorted flowering bulbs earlier this year. Once the flowers died, and foliage turned brown, she moved the whole pot outside, where it has sat for the last 6months. The only watering as such was from rain! Now, I noticed the bulbs seemed to have all sprouted, with healthy green tips about an inch above the soil. With really cold weather coming on, what should I do to promote flowering? I doubt they will survive outside left unprotected, and I think it’s too late to sink the pot into the cold ground now. Should we bring them indoors and allow to bloom, without repotting? I would appreciate your advice on saving these amazingly hardy potted bulbs. Thanks! Yes, bring them inside and put them in a sunny window and watch them grow. See what happens. I’m not sure if they will bloom again. Bulbs that are forced in containers have a difficult time reblooming unless they are planted in the ground. Even then. they may not bloom until next season after they “rebuild” the bulb. Are these tulips? Hardy bulbs need a cold dormant period to bloom. If the bulbs shoots are just an inch or two, you can store the pot in a frig for a few months to delay bloom. Keep the pots away from any fruit or vegetables as the ethylene they emit can damage the bulbs. Hello, I bought some tulip at the grocery store 2 days ago. They weren’t opened up yet. I put them outside it was 72 degrees today and pretty sunny. The flowers have been outside both days. I brought them inside both nights. It’s about 67-70 in my house. Today I noticed that the stems are starting to bend over now. Are they dying now how can I proglong there life. How do I know when they are dead and what is foliage? I’m a new homewowner and have never been into flowers. If I put them in the ground now will the tulips stay pretty? I also have hyacinth’s. They are bending over as well and are not even fully bloomed. What am I doing wrong? THank yoU!!!! You are keeping hyacinths and tulips in too warm temperatures. To prolong their blooming time keep them in cool temperatures around 50’sF and away from direct sun but bright indirect light. Foliage are the leaves and they should keep growing so that they can feed the bulbs for next year. It not a good idea to plant them while they are in bloom, wait until they are done blooming and then plant the pot of “leaves in the ground”. March 4 2009 Grand Rapids, Michigan I’ve read through many of your answers and believe I need a personalized answer for my situation. I bought my girlfriend potted tulips for valentines day thinking: “o man that will be cool she will get some beautiful flowers now and again next year if I plant them.” Now I realize its more work than that. We have winters with temperatures usually between 10 and 30 degrees F sometimes below 0 F. And due to Lake Michigan the weather is a little crazy all year long you never know what you will get. Can tulip bulbs be left in the ground if the temperature will be below 0 F? Yes, tulips can be left in the ground year round. They are hardy and will withstand freezing temperatures as long as they are planted in the ground. They need a cold dormant period in order to bloom the next season. Once the tulips are done blooming, let the foliage grow and eventually die back. You can then plant them in the ground or store the bulbs in a cool place and plant them in the fall. Another option (I have tried )is as soon as the soil can be worked and the tulips are finished blooming, plant the contents of the pot in the ground and let the foliage die back outside. That way, you won’t have to store the bulbs and try to remember to plant them in the fall. Now that we’re heading into March & hopefully warmer weather soon, I was wondering when I should water the potted tulips that have sat out all winter on the balcony. There is till cold weather (upto -14C, with windchill of -20) predicted ahead, so maybe I should wait a little longer, till temperatures stay above 0C consistently? Wait till the weather warms up. Once you see shoots growing then start watering. The pot will have to stay out on the balcony b’cos it’s a large 15″ one- I will cover it with a plastic bag to further protect it & check on it every so often. I hope to see tulips once it gets warmer! Do I need to fertilise it at any time? I’ve also planted a garden Lily bulb with the tulips- it should be ok, too right? Sorry I didn’t realize it was on the balcony. Since the container is outdoors, you can add some mulch (straw, pine boughs, wood chips) on top on the container for more insulation. Skip the plastic-that won’t do. The container needs to breathe and plastic will trap hot air inside when the sun hits it, which can harm the bulbs. Fertilize when you are planting the bulbs by adding a slow-release fertilizer (too late now)to the soil and after the bulbs are done blooming. A hardy lily should be fine. It will bloom later in the season-usually around June. I just planted tulip bulbs in a plastic pot with Miracle Gro soil & watered it thoroughly. As per your advise above, I have insulated the pot with newspaper & bubble-wrapped the pot. Do I need to cover the whole pot, top & all? Or can I leave the top open? Temps currently are at -10C, with snow flurries off & on. The pot will be on my north-facing balcony with hostas & hydrangea similarly protected- pls do let me know what else I should do to over-winter the pots. Thanks! I would place or cover the whole pot in a plastic bag. This will help keep the moisture in and excessive moisture out. Check periodically to make sure that it doesn’t get too wet and moldy. You can also take the potted bulbs and store them inside a cooler, styrofoam box or refrigerator (without ripe fruit). You want to keep your bulbs just above freezing (35-40F). After 12 weeks, remove the bulbs from cold storage-they should have 1-2 inches of growth on them and bring them indoors to a cool room out of direct light for a week. After a week, place your pot in direct sun in a warm room and watch the shoots turn green. I just bought some tulip bulbs, & would like to know the best way to pot them. I plan to leave the pot outside on my 22nd floor balcony, facing north-east in southern ontario. What should I do to prevent the pot from freezing when temperatures fall to below -20C in winter? Should I prepare the soil with a fertiliser/feed? Is Miracle Grow soilless mix a good potting soil to use? You can plant them in pots in Miracle grow mix and place them in a styrofoam cooler when temperatures start to fall below 32F to protect them from freezing. In extreme cold you may have to cover the cooler as well. Bulbs need temperatures of 35-40F for 8-12 wks to develop a good root system. I bought tulip bulbs way back in sept’07, but delayed planting till almost end-March’08. Not surprisingly, just a few enterprising ones grew 3″leaves & then yellowed & died.! I’ve left the bulbs still in their 12″plastic pot & would like to know whether there’s any chance they will bloom in the coming spring? If yes, what should I do to prepare them for winter? The pot is in the corner of my north-east facing balcony, which gets 2″ of sun for about 1/2 hr every morning & a bit again at sunset. I do really hate throwing out any plants & would love to be able to save these too! I’m afraid there won’t be any flowers next spring. It sound as if the tulips did not get enough growth to replenish the bulb. It’s all about rebuuilding the bulb for the next season. Forced bulbs have a difficult time reblooming because they don’t build up enough nutrients to rebuild the bulb; that’s why its recommended that you plant the bulbs outdoors after growing in a pot, where there’s a better chance for optimal growth. Plant it in soil outdoors and see what you get next year. You might proove me wrong and get flowers. If you live in a colder climate and the pots stay outdoors on your balcony during the winter, you risk freezing the bulbs which then will be of no use. I have heard that feeding potted bulbs a low alcohol solution will retard their height thus preventing them from falling over. Is this correct? Yes, experiments have been done on forced paperwhite narcissus and proven to work. See the paperwhite article. I guess I was asking whether I could just let the leaves die back and have the hyacinth rebloom next year. The foliage is still there but I can let it grow til it does die back. If I cut the dead foliage when it’s time, can I leave the bulb in the pot and will it rebloom next year? The general rule is bulbs that have been forced in a pot should not be forced again-which is what you want to do but you can try it. After blooming, place the pot in a sunny area, feed once a week with a diluted fertilizer and let the foliage continue to grow until it totally turns brown. This might replenish the bulb enough so that it will re-bloom the next season. Furthermore, you will have to repot it in fresh soil and give it a cool period (35-45F) for 8-12 weeks. After all that, you may or may not get it to bloom-that’s why it’s simpler to plant it outdoors, if you can. Forced hyacinths, when planted outdoors to rebloom usually develop smaller flower heads. Ok, there are two things we need to discuss. 1. The pot of spent tulips. Let the foliage die back completely either in the pot or you can plant them permanently outdoors as long as temps are above freezing. Just pull out the whole root ball and bulbs and plant it deep enough so the bulbs are 5-6 inches below the soil line. Choose a spot that does not get excessively wet in the summer. It is important to let the foliage die back so the bulb can replenish itself for next year’s bloom. . If you keep the bulbs in the pot then you can store them through the summer and plant them in the fall. Forced tulips use up so much energy out of the bulb that sometimes they may not rebloom right away and they should not be forced again. 2. When forcing tulips start with new bulbs(no parrot, cottage or species). Plant them in moist soil mix, cover the pot with foil or plastic and store the planted pot in the frig . Keep the soil slightly moist-not wet. Tulips require a cold period(35-45F) of 12 weeks at which time they will develop a root system and yellowish sprouts. They then can be brought out to warmer temperatures(60F) and indirect light to green up. From this point it should take 2-4 wks to bloom which will last 10-14 days. The life span of potted tulips is at best 2 weeks given the right conditons. It is best to keep them in a cool place away from direct sunlight. I would leave them in the pot as transplanting right now will only shorten the lifespan of the flowers. You can put them outdoors if temperatures are above 40 degrees. Tulips are considered an annual bulb in the South because the summers are too wet for them to stay in the ground and the winters are not cold enough. One things you can try is after blooming, let the foliage grow until it dies back. Store the bulbs in a cool dry place during the summer. In Sept. place the bulbs in the refrigerator and chill them for 8-12wks. This will simulate the cooling period that tulips need in order to bloom. Plant in the ground in Nov. adding bulb booster to the soil and hopefully they will have enough energy to rebloom. Potted tulips use up a lot of energy to bloom and may not rebloom. Hi I received a potted Tulip 5 days back. I watered it a little bit to keep the soil moist. But since yesterday i have noticed that the foliage is going yellow. Even the new sprouts are not green and healthy. What did i do wrong? how can i save it? Since you had it for 5 days, I am going to assume that the plant has bloomed and is dying back(yellowing leaves)which is natural. It’s done. Generally, they should last for 1 to 2 weeks depending temperature, light level and at what stage of growth you received it. If you received a green plant that is showing symptoms of discoloration, premature wilting and flowers that abort or dry up, those are indicators of different problems. These symptoms can be caused by either ethylene gas exposure in shipping/ storage , excessive cold storage of the plant or a fungal disease can attack the plant when it is stressed. I was forced to dig up some bulbs yesterday. I would like to replant this fall. I rinsed them and am drying them, with some perlite. What else should I do so that they will grow when I replant them in September? The most important factor for reblooming is whether the bulbs had a chance to die back its leaves. They need to put back the nutrition required for next years bloom. In Sept. when you plant work up the soil, add organic material and a â€œbulb boosterâ€ for good root development. Sprinkle the fertilizer on top of the soil not in the hole and water it in. I would like to use shredded newspaper as a mulch. Can I use the colored paper also or will it hurt my plants? If you didn’t bury the pot deep enough chances are that they froze or were in too wet soil. Wait and see what happens if they are rotten you will eventually find out. The bulbs should be firm and have some roots and a green shoot by now. Anemone blanda is a cold-hardy tuber but may not have survived the winter as it tolerates maximum cold temperatures of minus 10. I received potted tulips as a birthday gift, but I don’t know how to care for them in terms of how much and with what frequency to water them, if they should be kept in the sun or shade, etc. I am away at college for another month and would like to keep these beautiful flowers healthy until I can get them home and into a more permanent situation. The life span of potted tulips is at best 2 weeks given the right conditons. Water them when the pot feels light and the surface of the soil is dry. It is best to keep them in a cool place away from direct sunlight. Warm temperatures will encourage the flower to “blow” open and shorten the life span. Once the flowers are done blooming, cut off the flower heads and continue to water allowing the foliage to keep growing in the pot. By the time you get home the leaves may be dying back (yellowing). Save your pot of bulbs and plant in the fall or spring outdoors. i RECEIVED POTTED TULIPS FOR EASTER AND WOULD LIKE TO PLANT THEM OUTSIDE IN THE FALL. dO i LEAVE THEM IN THE POT? WHEN DO I TAKE THEM OUT? You can let the foliage die back in the pot and save it for fall planting or you can plant them in the ground as soon as you can dig. I find it’s easier to store them in the ground than trying to save them in the pot and hopefully remember to plant them in the fall.